We are immensely pleased to bring you the fourth annual iteration of REDEFINE magazine and Holocene’s collaborative hi-jinx in Austin! Best friends and co-conspiring dreamers Gina Altamura (talent buyer at Holocene) and Vivian Hua (Editor-in-Chief of REDEFINE) are throwing another free, all-ages, and unofficial DIY house party! We’re excited to be bringing on a new co-promoter this year – Portland’s own XRAY.FM, a new community radio station with very big ideas and a bevy of talented people on board to execute them. 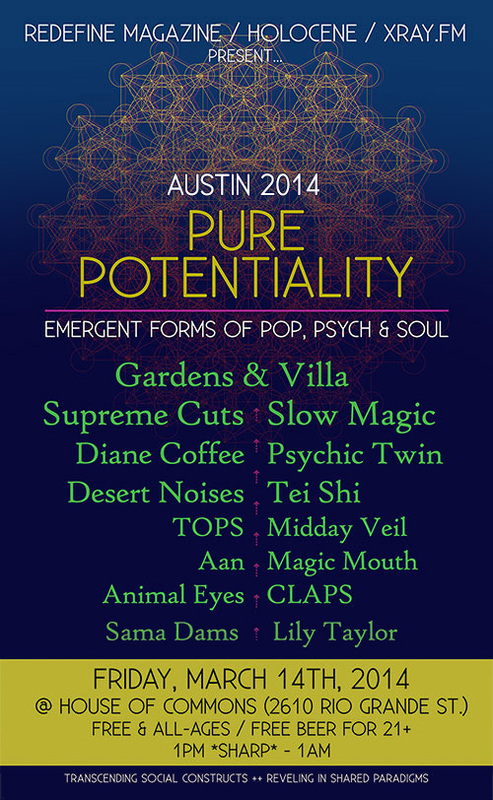 This year our theme is PURE POTENTIALITY, and we’re showcasing our favorite artists from across the country (including some of our hometown loves) who are exploring emergent forms of pop music, psych, and soul/R&B. The emphasis is on futuristic sounds, mystical / metaphysical subject matter, and the very noble effort to actualize innovative, boundary-pushing approaches to pop. With the year 2014 still young, we’re looking ahead and feeling the extraordinary potential of our generation of music-makers. We want to celebrate this exciting age with all of YOU! Join us as we dance into l’avenir! Tune into http://xray.fm/listen every Sunday at 4pm PST for INTUITIVE NAVIGATION, as Gina and Vivian preview these exciting musical acts and stretch the theme of Pure Potentiality to the radio airwaves.